Carole Hinders is an Iowa restauranteur who, in 2013, made several bank deposits under $10,000. She thought she was doing everyone a favor by keeping her transactions under $10,000, but this harmless activity caught the attention of the Internal Revenue Service. The Bank Secrecy Act requires financial institutions to report to the federal government deposits of $10,000 or more, as well as frequent deposits under the reporting threshold, known as "structuring." The law is meant to combat money laundering operations used to fund drug traffickers and terrorists, but, all too often, innocent people, like Hinders, unwittingly come on the radar of the IRS. Though Hinders was never charged, let alone convicted, of a crime, the IRS, through federal civil asset forfeiture laws, seized her bank account, worth nearly $33,000. "How can this happen?" Hinders told The New York Times, which, in October, scrutinized the powerful tax agency's abuse of civil asset forfeiture. "Who takes your money before they prove that you’ve done anything wrong with it?" Hinders, who, after a long legal battle, got her money back, isn't alone. Many other legitimate businesses have fallen victim to abuse of civil asset forfeiture laws. In February, the House Ways and Means Subcomittee on Oversight heard testimony from three business owners, none of whom were ever charged with a crime, whose banks accounts were seized by the IRS. It was an unusual scene on Capitol Hill, as Republicans and Democrats on the subcommittee sternly criticized the IRS for the seizures. The Institute for Justice, in February, explained that the IRS seized $242 million from 2005 to 2012. Of the 2,500 cases, in at least one-third, structuring was the only criminal activity suspected. IRS Commissioner John Koskinen defended his agency, offering a gross intrepretation of the law to justify seizures. "On average over the last several years, it's less than 200 cases," Koskinen told lawmakers. "In 60 percent of those cases, the owner of the asset never shows up, which shows that they obviously had a criminal activity going on." In the eyes of Koskinen and the IRS, your and your money are guilty until proven innocent. Senate Judiciary Committee Chairman Chuck Grassley (R-IA) plans to dive further into the subject. The Iowa Republican announced that his committee will hold a hearing on Wednesday, April 15 at 10am that will analyze the use of civil asset forfeiture by the Justice Department and the IRS. 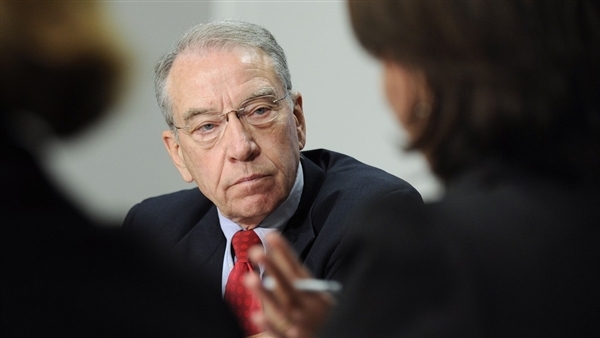 For Grassley, the issue hits home. The DesMoines Register recently investigated the use of civil asset forfeiture, exposing abuse by the IRS and local law enforcement. Additionally, the Justice Department facilitates abuse of civil asset forfeiture by adopting assets seized by local law enforcement and returning a large portion of the proceeds to them. Grassley has long teased federal civil asset forfeiture reform legislation to protect innocent people and their property, but he hasn't revealed any significant details. In January, he did, however, sign a bipartisan letter to Attorney General Eric Holder in which he and Sen. Mike Lee (R-UT) and Reps. John Conyers (D-MI) and Jim Sensenbrenner (R-WI) raised concerns about the Justice Department's adoption of asset seized by local law enforcement. "Under this arrangement, state and local law enforcement agencies bring property seized under state law to a federal seizing agency for federal forfeiture and then can receive up to 80% of the proceeds of the resulting forfeiture," the letter stated. "We are concerned that these seizures might circumvent state forfeiture law restrictions, create improper incentives on the part of state and local law enforcement, and unnecessarily burden our federal authorities." The details of the hearing, though, offers some insight into how far Grassley may be willing to go. According to the news release from his office, the Senate Judiciary Committee will explore the "perverse incentives associated with equitable sharing and federal adoption of seizures by state and local officials" and "examine the use of forfeiture in financial structuring cases and recent policy changes by the Department of Justice that purport to require evidence of significant criminal activity prior to pursuing forfeitures." Grassley, who is concerned that civil asset forfeiture "has become too much of a money-making business for the government," adding that "the rule of law ought to be about protecting innocent people, not padding the coffers of the federal treasury." Also, he's skeptical of recent Justice Department policy changes, noting that "loopholes have undermined [reform] efforts," and that "legislation is still necessary" to codify the administrative changes and address loopholes. Sen. Rand Paul (R-KY) and Rep. Tim Walberg (R-MI) have introduced the Fifth Amendment Integrity Restoration (FAIR) Act, which would reform federal civil asset forfeiture laws to allow individuals to contest seizures, putting the burden of proof of the government, and address the profit motive often behind seizures. But because Grassley holds the gavel in the Senate Judiciary Committee, if any federal civil asset forfeiture reform is to happen in the current Congress, it'll likely be his bill that gets action.